In the last couple of months, this particular album has received so much negative responses on the net that it is starting to look like the previously widely accepted band Baroness is entering a phase of instant-Bring Me The Horizon-syndrome. The cries and loud screeches of internet-hate are probably not a big surprise, as that situation largely tends to happen whenever a band makes a shift from metal to experimental indie. But as the baroness-business makes it ways to other territories, we can only conclude with the fact that Baroness indeed is it’s own monster, and that it is mainly up to the band themselves what they want to do with their sound. 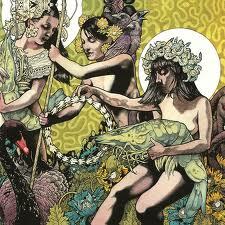 Weep all you want, fellow metal fans, but Baroness have left us, seemingly for good. On the other side, they have not left great music behind. They have taken it in their arms, and brought it into another realm, which might sound worse than the double album really is, the realm of indie and southern rock. There are so many different styles of musical writing on this platter, that it comes across like a giant mess through the first listens, but really just add a nice variation a double LP need when you enter your fourth plough-through. The punchy single, “Take My Bones Away”, with the albums nearly sole heavy riff and powerful vocal lines, the sneaky indie groove of “Little Thing”, the Franz Ferdinand worship titled “Sea Lungs”, and even a folk verse/ atmospheric piece, “Twinkler”. This CD is as diverse as Devin Townsends back catalogue (ok, not entirely), and the shifts in styles are really justified by the quality of the material. The double LP is split up in two different parts, the Yellow album, and the Green one. They are both accompanied by their own, separate intro-tracks, which both are indicators on just how great Baroness’ stylistic change has been. The Yellow theme is just a piece of meandering, serene melodies and silent harmonies, and really shows that even dead-simple songs can have their quality when Baroness writes them. The following songs are stock full of sparkling sonic adventures and catchy melodies, even the feat of crafty dynamics is possessed by the band, which they often use to underline a certain melody. Examples on dynamic truckloads are found in the third song, “March To The Sea”, the chorus of which sports an anthemic vocal shout, and swirling Mastodon-inspired guitarnotes. The sprawling salute of harmonies that occur during the bridge brings the song to a new level, before it ends on the surf-like bass the song initially began with. Highlights of the first side contain the two longer songs, “Eula” and “Back Where I Belong”. The former spray out a streak of the albums best chord progressions, the mood shifting with every change of chords, and thereafter flow into a very Queen-ish solo. It should be noted that only the first half of the song is worthy of the Highlight title, the second half wandering into anonymous parts, and thereby ending with little fanfare. “Eula” fares better, with its stark vocal lines, and Baroness signature-dynamics. Then follows the Green theme and another set of songs. The Green theme is ultimately the better theme, the quality brought forth by a memorable melody, and the victorious march of wah-guitars. The Green album is by far the most experimental one, and is really the the most interesting one of the dual records. “Board Up The House” is a streak of great ideas and positive vibes, and is followed by the beautiful riff-sequence of “Mtns. (The Crown & Anchor)”. Afterwards follows one of the albums missteps, the pondering balladry of “Foolsong”. There is really so much to talk about on this record that I must try to hinder myself from deriving the review of quality by explaining every piece of music there is, but you get the point, This record contains so much of everything that most bands will never achieve that rate of exploration throughout their whole career. Unfortunately, there is to be found a strange downside to this album. It seems to me like most of the songs start of with great parts and excellent stylistic control, but run out of the creative flow some place throughout the end. “Take My Bones Away”s momentum is drastically hindered by its creators choice to moderate the guitars on the last chorus, which is also done on the last chorus of “Cocainium”. Its a disturbing and ill-fitting thing to do when the refrains are so well constructed to begin with. It also can’t be helped that, though everything is fresh and interesting, the attention span of the regular musical fanatic will start to burst about halfway into the Green album. Then take the couple of sub-par songs, “Foolsong” and “Collapse”, and it’s no perfect record. Still I consider this double LP a great feat from a respected band, whose stylistic change should be well justified by the time they release their next album of rock-infused indie (unless they are going to take a 180 degree turn again). This record is not for everyone, and the majority of metalheads will only shake their head in disapproval by bewildering tunes such as “Psalms Alive”. But guys, ever since the shift from dirty sludge to controlled heavy rock on the Red Album, to the shift from heavy rock to souther twang on the Blue Record, Baroness has been strolling this way ever since the beginning. Take it or leave it, for the open-minded listener, Yellow & Green can prove an exhilarating listen bound the be replayed during the next couple of years. Roll on Baroness, I will be waiting for the Purple Cassette to be written.